After graduating from law school, Mr. Lattier moved to Helena, Montana, and worked as a law clerk for the chief justice of the Montana Supreme Court. Subsequently, he became an associate, and later a partner, with Montana’s oldest firm, located in Helena. In 1995, Mr. Lattier moved to the Mountain South, settling in Kingsport, Tennessee. 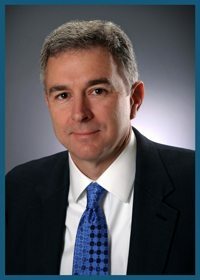 He has been a partner with Hunter, Smith and Davis, LLP, since 2002. His practice includes helping clients with business and commercial transactions, working with employers, and litigating cases when issues arise that cannot be resolved informally. He has the distinction of trying the first case before a Sullivan County jury under the Tennessee Adult Protection Act, which resulted in a successful verdict for his client. A native of Shreveport, Louisiana, Mr. Lattier has resided in Kingsport, Tennessee, since 1995. He currently serves as vice chair for the Dawn of Hope and as general counsel to the Sequoyah Council of the Boy Scouts of America. Mr. Lattier is a past chair of Leadership Kingsport, the Arts Council of Greater Kingsport, and Girls, Inc. He has also been actively involved in the legal community, previously serving as treasurer and president of the Kingsport Bar Association. Mr. Lattier is married and has three children. He enjoys many of the region’s outdoor activities, including backpacking along the Appalachian Trail, canoeing and camping.